Celebrating over 50 years of Customer Commitment, Scott Industries offers Full Service Solutions in Automation and Material Handling Systems throughout the World. Scott Industries Diverse Application knowledge and experience, insure timely delivery and execution of cost effective, robust solutions for your application. Your First Choice for Automation and Material Handling Solutions. Delivering continuous innovation to companies around the world. Scott Industries is an ISO 9002 Certified supplier, providing full in‐house mechanical, pneumatic, and controls engineering capabilities. Scott also leverages internal its build resources in fabrication, machining, electrical, and assembly for all phases of your project. Scott Industries utilizes its internal resources to concept, design, and execute according to your specific program requirements. 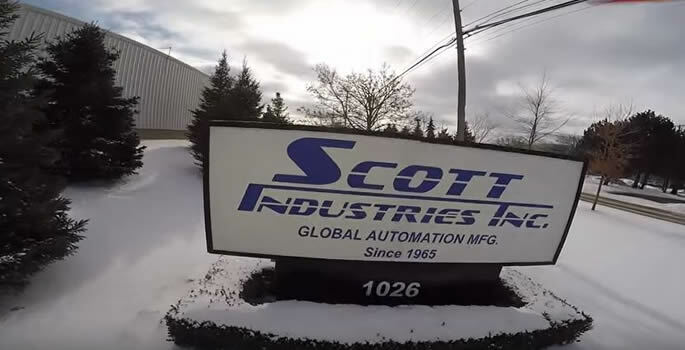 Scott Industries is committed to becoming one of the premier manufacturing companies in the world. Our efforts toward total quality will yield a level of customer satisfaction unsurpassed in our industry.